The Ernie Bonner Papers in PSU Library Special Collections are the main source for Michael Andersen’s “The Secret History of Portland’s Weirdest Neighborhood,” the second in series of articles about the Lloyd District published by BikePortland.org. Ernie Bonner (1932 – 2004) served as chief planner in Cleveland, Ohio before he was recruited to Portland as the City’s Director of Urban Planning in 1973. He acted as Portland’s chief urban planner until 1978. After leaving the City Council he worked as a Metro councilor, president of Sunlight Energy Systems, and as an energy conservation manager for Bonneville Power Administration. Later he worked or volunteered with various Portland groups including Riverfront for People, Metro 7, Portland Planning Commission, and the Park Blocks Foundation. The collection of Ernie Bonner Papers is comprised of materials from Bonner’s career, research, and urban planning projects. All of the documents are related directly to Portland, Oregon and are focused, with very few exceptions, on public planning. The material ranges primarily from the time Bonner was active in Portland planning and development (1970s-2003), but he also used and assembled a significant amount of historical material dating from 1919 through the early 1940s. 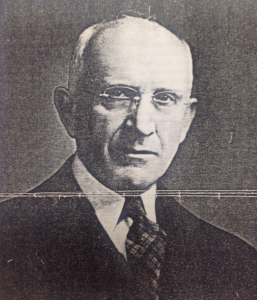 Notably, for the BikePortland piece, it also includes a manuscript biography of Ralph Lloyd, the Los Angeles millionaire developer who purchased much of the land in today’s Lloyd District. For most of Portland’s history, the land we know today as the Lloyd District was best known for failure. But how did the Lloyd District become a suburb hidden in the middle of a city? And what happened as the 20th century ended that has started to open it back up — putting it on course to become what could be, 10 or 15 years from now, the most bike-oriented high-rise neighborhood in the country? The answers to those questions tell a story about Portland, and a story about all American cities. They also suggest a lesson that Portland, like all American cities, is still struggling to learn about itself. Read “The Secret History of Portland’s Weirdest Neighborhood” at BikePortland. See digitized materials from the Ernie Bonner Collection in PDXScholar. Learn more about the complete collection of Ernie Bonner materials held by PSU Library Special Collections, including the Ernie Bonner Papers, 1919-2003 and the Ernie Bonner Oral History Collection, 1994-2004.